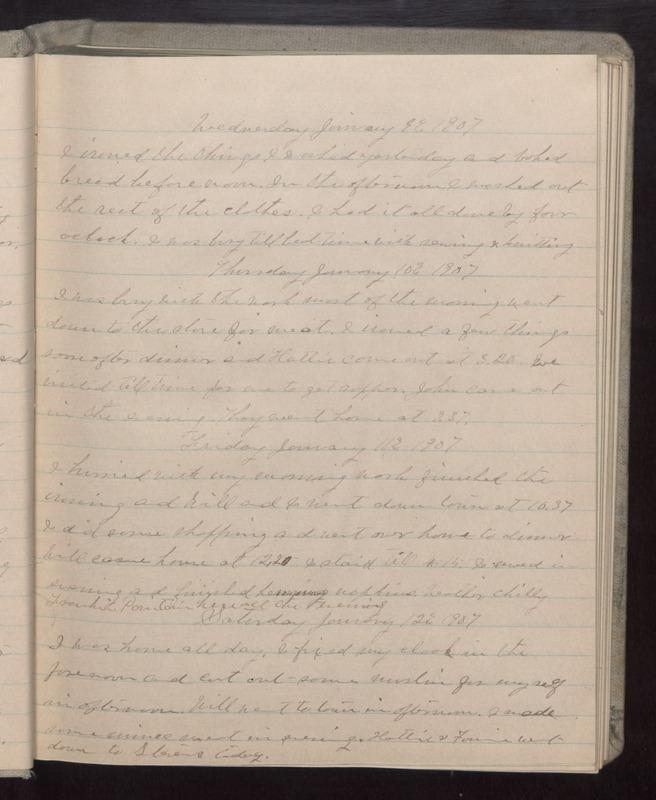 Wednesday January 9 1907 I ironed the things I washed yesterday and baked bread before noon. In the afternoon I washed out the rest of the clothes. I had it all done by four oclock. I was busy till bed time with sewing & knitting Thursday January 10 1907 I was busy with the work most of the morning. Went down to the store for meat. I ironed a few things soon after dinner and Hattie came out at 3.20. We visited till time for me to get supper. John came out in the evening. They went home at 9.37. Friday January 11 1907 I hurried with my morning work, finished the ironing and Will and I went down town at 10.37. I did some shopping and went over home to dinner. Will came home at 12.20. I staid till 4.15. I sewed in evening and finished hemming napkins. Weather chilly. Frankie Pointain here all the evening Saturday January 12 1907 I was home all day. I fixed my cloak in the forenoon and cut out some muslin for myself in afternoon. Will went to town in afternoon. I made some mince meat in evening. Hattie & Fannie went down to Stevens today.